One of the most challenging experiences for owners and their dogs can be visits to the vet. Tension runs high, so very often, dogs will exhibit behaviors they never do anywhere else. Teaching your dog handling skills to make checkups and other vet visits less of an ordeal can make these trips much less traumatic for both the dog and their person. First, I like to bring my dogs into our vet’s office for exposure, even when we don’t have an appointment set up. We will go in, practice simple obedience commands like sit-stays and focus, and make the lobby area a place that doesn’t always evoke stress. I will also ask the receptionist if they are will to come around and just give my puppy a treat and some love. If every time you go into a vet’s office, the dog feels tension from you or the unknown environment, it sets them up for stress responses that are often not part of their normal behavior patterns. By desensitizing the lobby area, your dog will learn to engage with you and settle down when waiting for an appointment. Being able to comfortably handle your dog during an examination is also crucial to a successful, stress-free vet visit. From the time your dog comes home, handling should be a regularly practiced exercise. Take each of your dog’s feet and rub them, check inside their ears, lift their lips to look at their teeth, and run your hands along the entirety of their bodies. Practice each of these while rewarding them with food and/or praise when they remain calm through each manipulation. If there are areas your dog is more sensitive about, take very slow steps and increase their tolerance of contact in that particular space. Making your dog comfortable with restraint is also important. Sometimes your dog will need to be contained in order to gives shots or check an injury, and making sure your dog doesn’t begin to flail when restrained can make the examination less stressful. Practice wrapping your arms around them and applying pressure, flipping them onto their side or back, and again, rewarding calm responses to these manipulations. Another very useful tool can be conditioning a muzzle. Throwing a muzzle on an uncomfortable dog who is already exhibiting nervous responses can dramatically exacerbate the problem if they are not comfortable with the equipment. As discussed in a previous article, make sure your dog is used to wearing the equipment so that if the situation should arise that they need it, you can ensure they will not panic once it is placed on their face. Always be honest with your vet if there are certain things your dog is uncomfortable with having done to them. 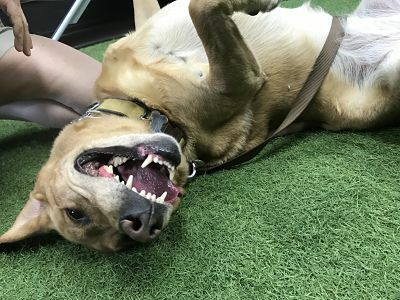 While we can take every precaution and implement as many positive training exercises as we can, there may be a situation that arises that causes your dog to respond in a new way. Spend time making sure your dog is tolerant of invasive handling and strangers is a great way to help make vet trips as stress-free as possible! If you enjoyed this post, you should read How to Keep Your Pup Cool In Hot Weather here. How do you handle your pup’s vet visits? Share below!